Forget what you know about Black Uhuru. Forget about the Grammy in 1985. Forget about Sly and Robbie. Forget about Mykal Rose and Junior Reid and Don Carlos and Puma. Forget about who came to dinner and forget about what’s growing in your backyard. All that’s left of Black Uhuru in 2018 is Duckie Simpson, which is fitting since he was the last original member standing within five years of the group’s start in 1972, long before the roots reggae outfit had achieved any sort of international notoriety. Of course Black Uhuru’s line up has been pretty bare bones since the Strongg album in ‘94, but there hasn’t been a new album with the Black Uhuru brand since 2001’s Dynasty. So, what would a Duckie Simpson, ahem… Excuse me. What would a Black Uhuru album sound like in 2018, during the age of Auto-tune and drum machines? After only a few listens, I can tell you that it is crucial to NOT go in with any expectations. I’m actually surprised how some parts of the new album, As the World Turns, still retain the essence of the Black Uhuru sound. It could be smart production and/or musicianship, the strength of Duckie’s enduring vibe, or, perhaps, my imagination, though it is likely a combination of all three. I believe the Black Uhuru essence is detectable in tracks like Chalice, Spectrum, and Slaughter. But Chalice, for instance, also features the use of Auto-tune key-correction software, a clear indication that this is not 1984 and maybe even a possible trigger for some reggae fans who find the robotic sound that it imposes on vocals to be overused and overproduced. I personally think that such zeal and expectations of musical purity are silly if not unsustainable, and I like the idea of blending up all vibes in as many ways as possible. For my money, Chalice is the best track on the album, and it is precisely because I think that it has a cool, relevant sound. It was actually released in a previous form in 2013, with a fuller, more traditional roots reggae backing track and NO Auto-tune. At the time we were told the single was a sign of a new Black Uhuru album on the way, and if it took five years to figure out that the riddim should be stripped down and that Duckie needed a little Auto-tune update, I believe it was time well spent. Another song that stands out is Stronger, due in no small part to the featured artist, Agent Sasco’s, incredible performance. The one drop riddim that Stronger is built on has a modern vibe and is at least partly built from samples, though in a very subtle way. Live & Learn has a more obvious hip hop influence and, although Duckie feels slightly awkward on the track, Prezident Brown absolutely destroys it. Duckie is more in his element on tunes like War Crimes, a minimalistic, quasi-acoustic roots song with multiple back up singers, a horn section, and nyabinghi drums, and Betrayal, a fairly straightforward one drop banger. The weakest moments on the project occur when Duckie steps out of his roots reggae comfort zone to explore other Jamaican musical movements like rocksteady on Stand Alone and dancehall on 5 Star General and Ganja Baby. It’s just too much of a departure - too far off-brand. I would have rather seen a full Black Uhuru album that explores the stripped down, modern roots formula applied to Chalice. I also find the updates to Bob Marley and Junior Murvin classics to be unnecessary, and I think they take more away from the project than they add. 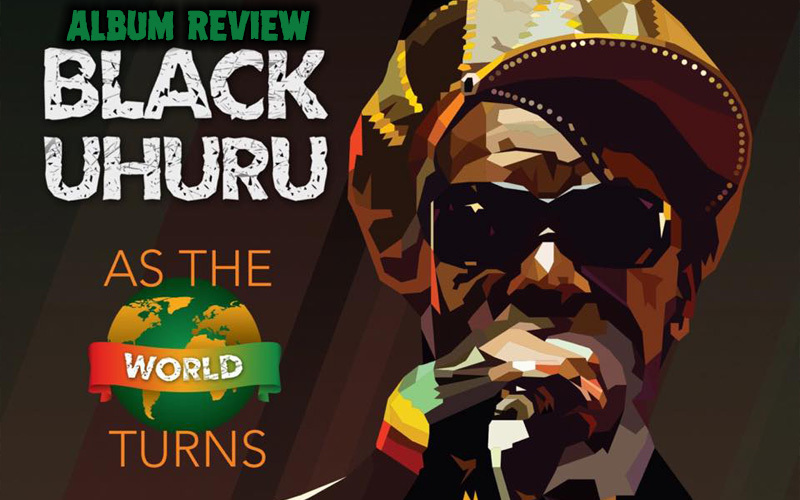 There are a lot of potential listeners out there, folks who would call themselves Black Uhuru fans who will see that there’s a new album and immediately generate expectations about what it should sound like based on what they’ve already heard from the brand. A better approach to As the World Turns would be to EXPECT creatives to create, no matter their age, and especially musicians at a time when technology has made it possible for anyone to produce and promote their own album. I would also suggest that any would be listeners EXPECT a man to exercise his right to use a brand he spent 46 years building in any fashion he pleases, since some will say that an album that strays so far from the original Black Uhuru sound tarnishes their legacy. Why should he put out a Duckie Simpson album when he will likely sell many more copies of a Black Uhuru album? It’s just good business.